Don’t be discouraged and don’t attempt to punish your hedgehog. The most important thing to do is to NOT give up or to quit handling your hedgehog. This is often easier said than done, but there are some things you can do to make handling easier. First and foremost try to determine the cause of your hedgehog biting in order to help you modify your hedgehog’s behavior. The hedgehog will sense if you are nervous or afraid,so it is best to learn ways to protect yourself. It’s very important not put your hedgehog down after it bites. Simply hold your hedgehog for another 10 to 15 minutes. This helps your hedgehog know that biting is not something it can do so that you will leave it alone. A hedgehog is likely to become unsocial if biting is not deterred. Find a pair of new dish washing, gardening or winter gloves that are tight fitting and flexible. Rub the gloves on your hands, arms, etc. to scrub your smell onto them. If your hedgehog bites, you can comfortably push back into his mouth – not too hard, but firmly. This will help the hedgehog associate biting you with something unpleasant, while at the same time saving your skin! Allow the hedgehog to sleep with the gloves in the cage or simply be in the cage. You can choose to scent the gloves as described previously or place them in the cage new. Scented gloves are likely to work best since the hedgehog will get to know your scent faster. 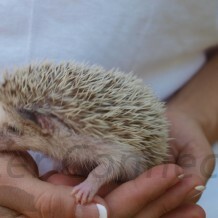 You will be more confident while wearing gloves and handling, which will also be a positive benefit for your hedgehog. Gloves are only a temporary fix. The goal is for your hedgehog to get over biting so you can enjoy your pet even more. This step is crucial to become friends again with your hedgehog. Hold your hedgehog while you have on a few layers of clothes and your hedgehog is covered by a shirt or towel that has your scent on it. You want your hedgehog to learn that you are warm, safe, and comfortable. If you can get your hedgehog to sleep while on your lap or in your arms, that is the BEST way to establish a bond that doesn’t involve teeth. The next step is when you feel safe and comfortable handling your hedgehog you need to look for patterns in biting. Most biting is not mean or aggressive, so determining a connection of something in the environment, time of day or activity is extremely helpful. By identifying times when your hedgehog is likely to bite, you can modify your handling so that you can avoid or prevent the bites.